2 Mbit/s and traffique unlimited internet connection is required for the SD ! 5 Mbit/s and traffique unlimited internet connection is required for HD ! NOVOE TV * is more than 60 channels multi-thematic Russians.. .via internet in HD quality, available in less than 5 minutes in your living room! 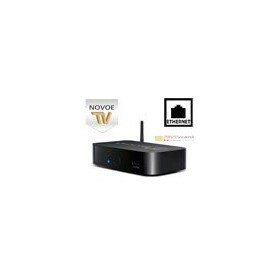 You live in an apartment and / or you can not install satellite dish to receive your favorite channels, you have internet access ADSL (mini 2 Mbps), then NOVOE TV is the solution. This pack included the IP receiver as well as a year subscription to the NOVOE TV channels.